Bespoke advice – our Healthy Home Audit is more than just providing you with a quote, we also give you advice on how to look after your carpets/upholstery. The more rooms you show us, the better advice we can give. Customer Care – as soon as you answer the door you will notice our respect and love towards carpets… we always wear plastic ‘booties’ over our shoes so we don’t bring in any dirt or pollutants! The Audit – we inspect your carpet(s)/upholstery and discuss all your areas of concern. We will enter all our findings into our laptop and produce for you a 3-page Healthy Home Report there and then. The Quotation – The report offers a range of packages for you. We will personally advise which cleaning package is best suited for your needs, but the choice is yours. You can book your chosen package there and then. Or if you need time to think/discuss with your partner/housemate(s) then that’s fine too! We will leave you with a copy of your Healthy Home Audit so you have all the details you need. …want to book in your free Healthy Home Audit? Call Careclean today on 01245 323 989 or request one online. … and for more information on how we work out our prices, click here. 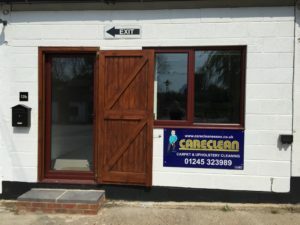 Careclean has been established for over 34 years and has a vast knowledge of carpet and upholstery cleaning and maintenance. We post a bi-weekly blog, which often includes carpet and upholstery cleaning tips, guidance on keeping your home clean and healthy, and offers and competitions. Click here to check out our blog. You can also follow us on Twitter and Facebook to keep up to date on all the latest news and offers.